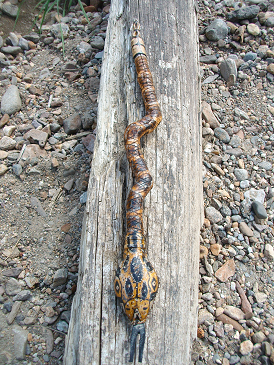 By the artist "Moon Cat", the Rattlesnake Rattle embodies the energy and medicine of the Rattlesnake. 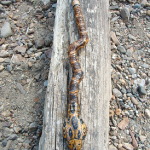 The Rattlesnake medicine transmutes energy, and is associated with wisdom, healing and rebirth. When we work with the Spirit of the Rattlesnake we undergo powerful transformations and deep healing; healing within the cellular structures of our bodies and within our DNA. This Rattle is made from rawhide and contains organic corn, selenite and clear quartz crystal within it. The "Rattle" is made from leather and hand painted. The curves within each snake rattle vary, as the curves within each stick that we use for the handles/bodies vary.